There will be fewer schools in Chicago next year, but they'll be just as segregated. There are two remedies for school segregation, neither of which have worked. You can attempt to get rid of the separation—that is, to desegregate the schools. Chicago long ago gave up on this method. That's being charitable; actually, the city never really tried it. If you believe desegregation just isn't going to happen, you focus instead on making the minority schools as good as the white ones. This has been the approach in Chicago for decades, with little to show for it. As I write in this week's paper, the gap in achievement between black students and white students has remained broad, and perhaps has even grown. The school board plans to put the money it will save by closing 50 schools into its separate-but-equal strategy. In most cases, it will be consolidating one poor, black, low-achieving school with another. The schools will be just as segregated, but their students will get iPads and air-conditioning. We need to recall the fundamental ideas articulated in Brown v. Board in 1954: Racial segregation in public schools "deprives children of the minority group of equal educational opportunities." Separate but equal "has no place in the field of public education." And yet, almost six decades after Brown, more than two-thirds of the African-American students in Chicago's public schools are in schools that are at least 90 percent African-American. Most of these kids are living near or below the poverty line. It's a good rule of thumb that schools full of poor kids won't be successful. When they are, it's so extraordinary it becomes a movie. The educational outcomes in racially isolated schools won't equal the outcomes in integrated or middle-class schools no matter how much data-driven instruction you give the students, or how many iPads you hand out. The judges in Brown said that separate was inherently unequal because it stigmatized the subordinate group. But separate-but-equal is also a losing proposition politically—because separation makes discrimination easy, and it makes not caring easy. It would be nice if taxpayers, out of the goodness of their hearts, were willing to spend what it takes to help the poor kids in the poor schools on the other side of town. More likely their hearts will open when their own kids or grandkids are in the same schools as the poor kids. The legacy of prior discrimination, including several hundred years of slavery, meant that when black children came here with their families from the south—in two big waves during the 20th century—they were poorer and behind white children academically. They needed not just the same educational opportunities as white kids were getting—they needed more. Instead, they got less. The better and more experienced teachers ended up in the white schools, while students in black schools often got rookies and subs. When schools in black neighborhoods grew overcrowded, they were put on double and sometimes triple shifts, resulting in a shorter day for black children. "Inferior education is the inevitable result of racial segregation," said the leaders of a massive school boycott here in 1963. Is it any less true 50 years later? The schools superintendent in 1963, Benjamin Willis, was one of the early proponents of making separate equal. A Willis proposal that year shows what typically happens with that approach. Willis said that instead of striving for integration, Chicago should concentrate on improving its poor black schools. That July, he outlined to the board a "saturation" program in the black neighborhood south of the Loop, then the city's poorest area. Classes would be limited to 25 students. Counseling and social welfare staff would be increased. There'd be prekindergarten for all of the four-year-olds. The city would use recent education innovations and provide whatever was necessary to create learning conditions "as nearly ideal as possible" in the saturation area. This prototype would then be extended to other poor neighborhoods "as funds became available." The program would be expensive, Willis told the board—but the board responded enthusiastically. Its president, Clair Roddewig, said, "If we are convinced—and I think most of us are already convinced—that it is going to take something of this magnitude to do the job that has to be done in this city, then somehow and in some way we will have to find the money to do it." But when it came time to allocate funds for the 1964 budget, somehow and in some way no money was found for the saturation program. "As funds become available" is a good adage for a segregated system. Can we desegregate Chicago's schools when only 9 percent of their students are white? It can't be done overnight, of course. But in a city that's one-third white, much more desegregation is possible. As I mention in this week's story, there may be a new dynamic in Chicago. Young white Chicagoans have generally had more experience with minorities than did their parents, and are more comfortable with diversity. They're more interested in city than in suburban life. And some of them may be stuck here awhile because of the flat housing market. They won't be as quick as their parents to flee for the suburbs once they have kids, if they feel CPS has something to offer them. In the short run a desegregation effort would mean more magnet and selective enrollment schools. Desegregation can also be facilitated if the city works with the suburbs on regional high schools, as other metro areas have. Could school desegregation devolve into gentrification? We'll address this subject more thoroughly in a coming article. (The story in this week's paper begins an occasional series on segregation and poverty in Chicago's schools.) It is true that the special schools benefit whites and more affluent students disproportionately. But they're also very diverse racially and economically; most are majority-minority. Like charters, the special schools deprive neighborhood schools of some top students—a valid concern. Unlike charters, which are overwhelmingly minority, the special schools enhance integration. Gentrification isn't much of a threat in a school system that's 91 percent minority and 87 percent low-income. 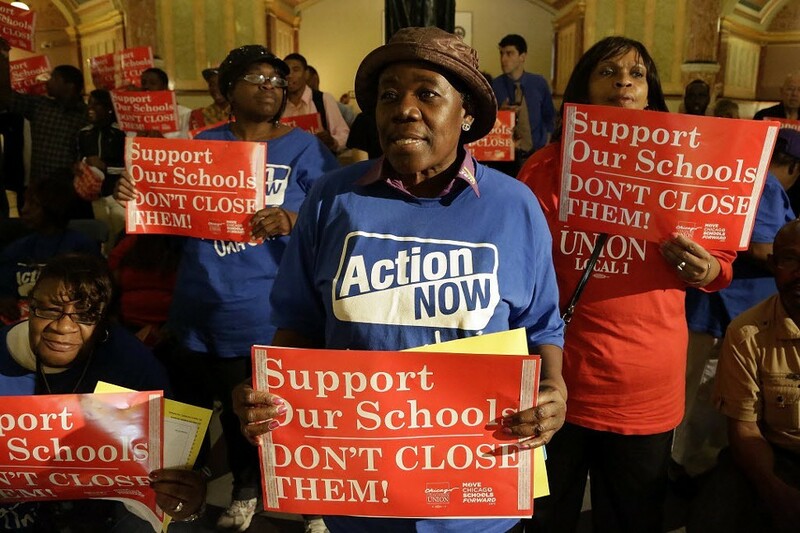 Chicago's schools simply need far more clout than a system with such numbers will ever have. Steve Bogira writes about segregation on Thursdays. Instead of focusing on test scores, school officials should work on reducing its staggering proportion of low-income students. Organizers of the Chicago contingent in the 1963 March on Washington say it's time for another movement. Home visiting helps at-risk mothers be better parents. But the program remains in jeopardy despite the Illinois stopgap budget deal. "Does this mean Rauner and Madigan are now friends?" and other key questions answered. The Cubs' manager orchestrates an extra-inning victory just as the not-time-to-panic stage was looming.